The Green Workplace: Is your shower curtain bad for you (or the world)? Is your shower curtain bad for you (or the world)? I have been an ardent avoider of all things poly-vinyl chloride (PVC) since I first saw the film Blue Vinyl a few years ago. The thing about vinyl is - and the Vinyl Institute is happy to tell you - it isn't always harmful when it is in use as a consumer product. It is reasonably durable and recyclable. Vinyl advocates will tell you that this makes it a 'green' product. However, there have been alarming discoveries that PVC is quite harmful at both ends of its lifecycle. And it my book, it isn't green if it harms the people who make it. From http://www.bluevinyl.org/: "PVC requires hazardous chemicals in its production and very hazardous chemicals, such as dioxin and PCBs, are byproducts of that same production. PVC leaches or releases harmful chemicals in some consumer products, and toxic byproducts, including dioxins, are created when it is burned. The manufacture of PVC can put worker health and fence-line communities at risk through exposure to hazardous chemicals that can cause a number of severe health problems including cancer, endometriosis, neurological damage, immune system damage, respiratory problems, liver and kidney damage, and birth defects." So I needed to purchase a new shower curtain liner and found myself on the bath products aisle looking for a good alternative. 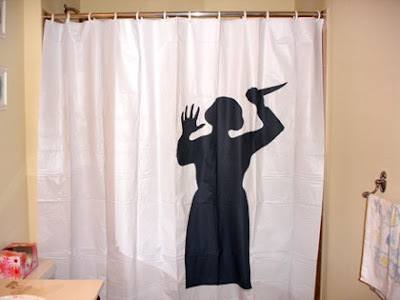 The good news is I found shower curtains made from ethylene-vinyl acetate (EVA) and polyester. I wasn't familiar with EVA, so I went with the mold-resistent polyester variety and looked up EVA when I got home. It's good to know that there are alternatives, however it seems that despite the risks, PVC production is still on the rise. If more educated consumers start shopping for alternative products to vinyl, maybe the trend can be reversed. with the smell that a new vinyl shower curtain puts off (hello VOCs!) i'm not convinced that it's not bad for the consumer when in use! Great to know that there are alternatives out there. I picked up an EVA shower curtain at Target about a year ago. They have a nice soft finish and don't smell (off-gas) like the typical vinyl/plastic curtain. At the time they were sold out of white so I had to purchase the off white/cream color. A few weeks later when I went back and saw the white in stock I picked one up and reused the "old" off-white one to replace the grimy and undersized shower curtain in the Men's shower at work. So HOK has had an EVA curtain in house for almost a year now.